Recap – January 2017 : Squad – Communicate. Coordinate. Conquer. Happy 2017! 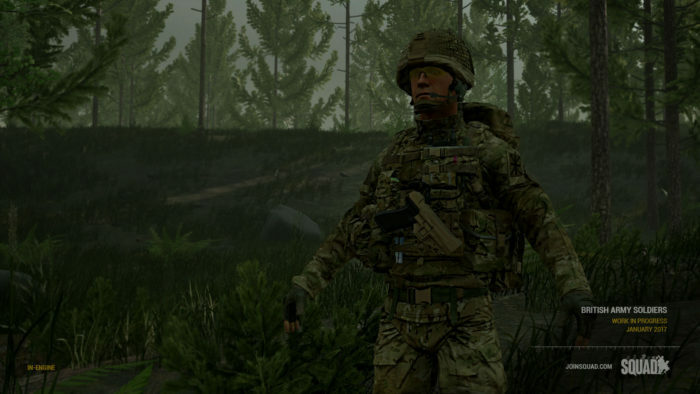 In December we worked hard to release Alpha 8.9 as a special patch on Squad’s first Steam birthday. 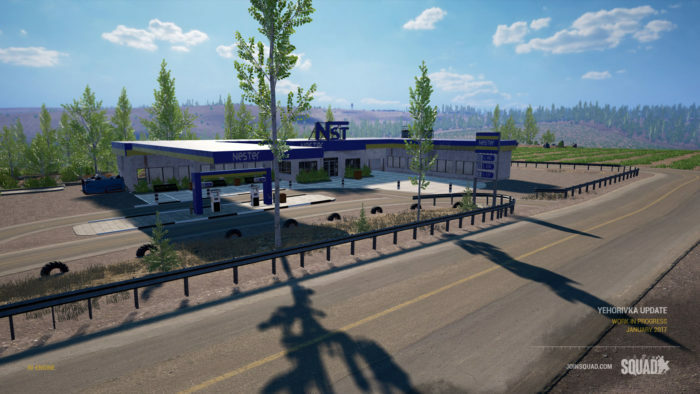 We were happy to celebrate the anniversary by streaming CCFN and Squad Ops, and releasing a new patch that included a brand new map for you to play in was our gift to you for the holidays. The real celebration for our team was having time off over the holidays to focus on our own well-being – a break that had been months in the making. We came back refreshed in January to venture to PAX South and work on all the goodies we wanted to pack into upcoming releases and this recap. In a combined effort Drav, Kory, Norby, Tjens and others have been working on bringing you many new vehicle types and overhauling the existing ones. 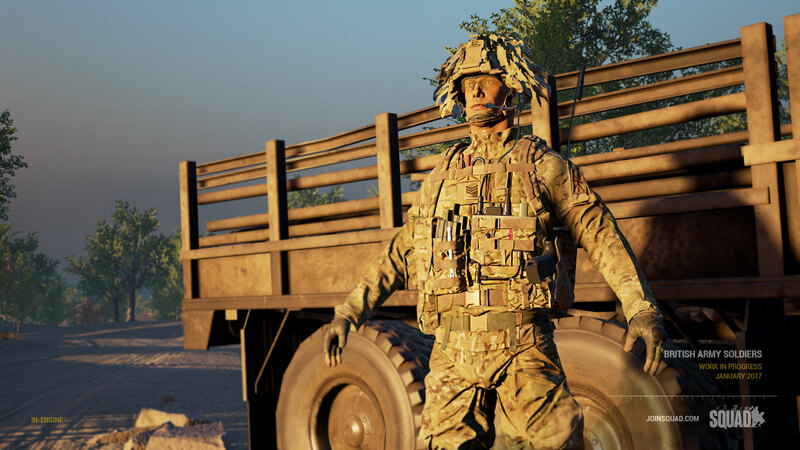 Code support for tracked and n-wheeled Vehicles (standing for vehicles that have any number of wheels) has been added, which allows for a whole new spectrum of ground vehicles. 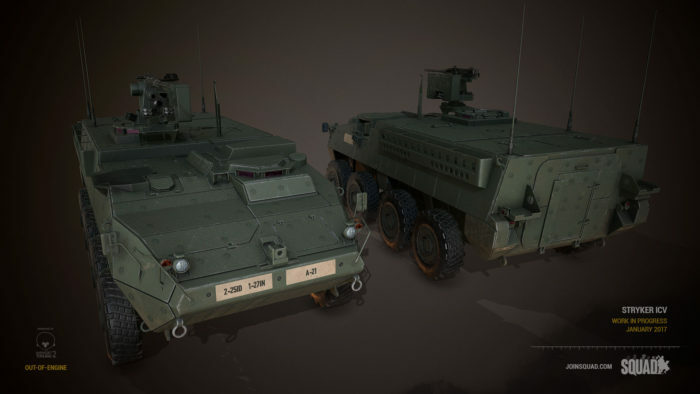 In Alpha 7 and 8 all of our vehicles are hard-coded to only four physical wheels, but with n-wheeled and tracked support we’ll be able to accurately simulate more of the unique wheel configurations seen in all of the different military vehicles we add, such as the Stryker and MTLB. Or even two wheeled vehicles like motorcycles. Further adjustments have been made to address the issues of vehicles getting stuck. Vehicles equipped with systems like locking differentials in reality are now also much more capable in the game. CoreInventory, introduced in our last recap, has been making incredibly steady progress. Since our last update, we’ve removed all of the old inventory and weapon code from our Soldier and replaced it with the new Core Inventory code. We’ve also cleaned out our old animation code in preparation for the new Animation System. As one of the primary goals for CoreInventory is to allow modders to create amazing things, we’ve also been spending time creating a large number of expandable features and examples for modders to dig into. For example, we’ve done a pass on our Zooming system, generalizing it and exposing a good amount of it to Blueprint to allow modders to easily add a Zoom functionality into any item, weapon, or vehicle seat. We’ve also put together a system for UMG full screen overlays, which can be used for dynamic and updating screens (like a more interactive CROWS UI, for example), as well as an easy Post-Process modifier. This is only a very small sample of the things that can be done with CoreInventory. We’ve been busy over the December and January period continuing to experiment and refine the new Animation System that we showed off back in November last year. In addition we’ve begun the process of integration which involves a lot of removal of old code and components, to make way for a lot of new stuff. One being the shift to a split first and third person system that would make a lot more player actions simpler and more elegant. But at the same time we’re still able to initiate a “true first person” style of movement and interaction on certain actions if need be. A lot of this will become clearer the more we begin putting our new system through its paces. One system we’re excited to see make strides on is Free-Look. What we’re testing at the moment relies on a button-press system (other control methods will be looked into later) where once activated, your mouse look will be unslaved from your weapon, and you’re free to look around. However you are still limited by how far you can turn your head without moving your entire body. When you exit out of Free-Look, your character will reorient his weapon to where you are looking at. This means you can look for targets, then if you spot something, you can train your weapon onto there really quickly. We’re still testing this system out and ironing out the kinks but we hope it’ll make it into the final game in one form or another. We’ve also worked more on the Climbing System, and are trying to refine the way your character registers obstacles and also checking for different heights. Based on the height of the obstacle, you will perform a different kind of climb or vault action. Naturally the lower the obstacle the faster it will be for you to negotiate it. We’ve begun work on probably the single most requested feature for Squad – a Server Queue! Currently, Unreal Engine must make a full server join attempt before being rejected due to the server being full, invalid password, or any other possible fail conditions. This actually makes a Server Queue quite difficult, as we don’t want players waiting in Queue to be stuck in a loading screen. 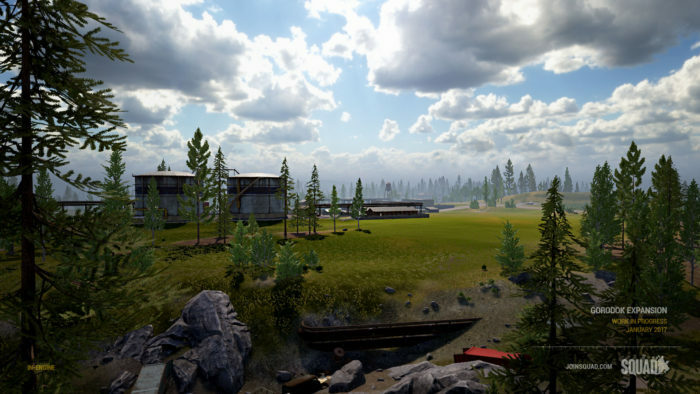 So, rather than make extensive engine changes to improve this behavior, we are building a system off of Unreal Engine’s OnlineBeacon system that will handle a number of pre-connect tasks from the Main Menu, including checking if the server is full, having a valid password, valid game version, and in the future ensuring that the proper mods are installed before making a full connection attempt to the server. 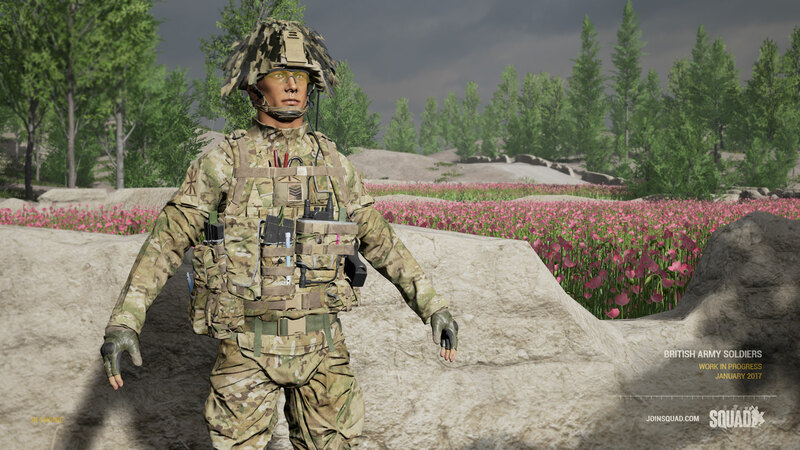 The Soldier models for the new British faction are making steady progress behind the scenes, with the texturing process complete and about to enter rigging for animation and final implementation. 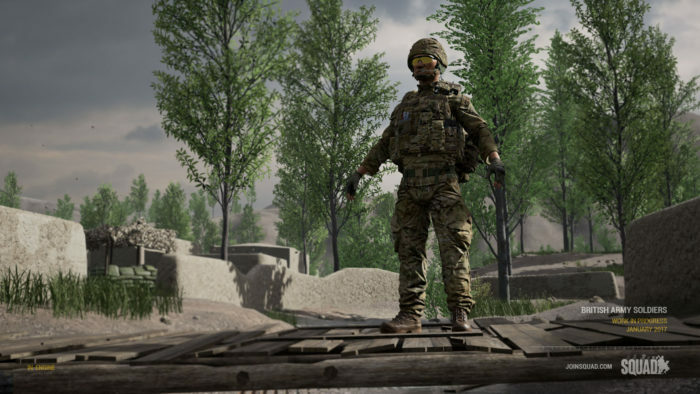 The unique helmet profile and liberal use of camouflage netting will help them differentiate themselves from the Americans once they begin to see action in-game. It’s a long time coming with this vehicle, and we’re just as itching as you are to see this piece of kit in action. We’ve just finished a texture pass on this bad boy and are preparing the N-Wheel piece of supporting code to give this vehicle the in-game handling and maneuverability it deserves. 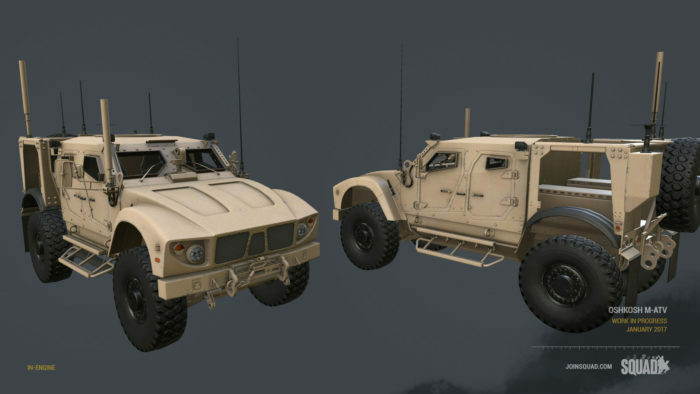 One vehicle we’ve yet to reveal is the M-ATV (MRAP All Terrain Vehicle), set for the American forces. 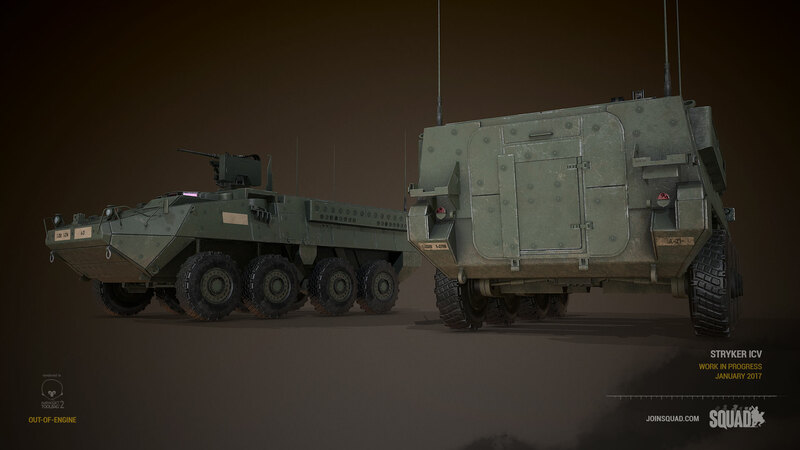 Designed to defend against mine and RPG attacks, this kind of vehicle offers much better protection compared to the more common M1151 Enhanced Armament Carriers. We can’t reveal much about its ingame details, but it’s an asset that we’re excited to put through the pipeline. 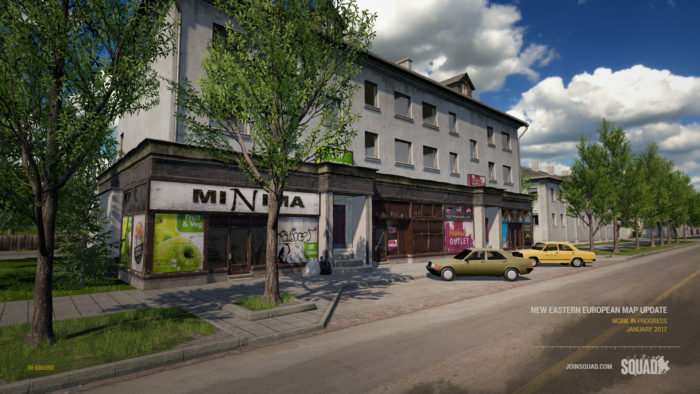 Squad’s first urban eastern European map is in full development. Fantastic new environment statics, buildings and set dressing from our Environment Art team is being finished up and the the map is taking on its own distinctive look. 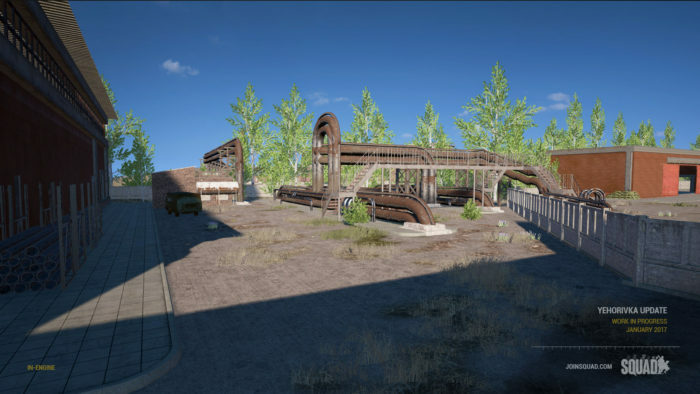 The gameplay areas will include multi-story apartment buildings, urban commercial areas, large industrial factories, and so much more! The update we have all been waiting for, 4k Gorodok and it is awesome! 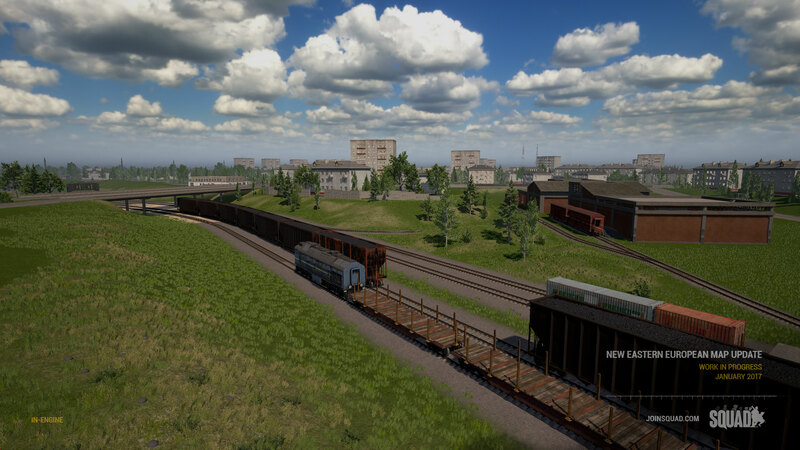 With this expansion comes several new locations including an industrial train station, a small apartment complex, and several small areas that really bring this rural zone to life, not to mention some tweaks to the existing areas we all know and love. With this expansion I would not expect the same map layers as before. Get those engines warmed up because you have a lot more ground to cover soldier! 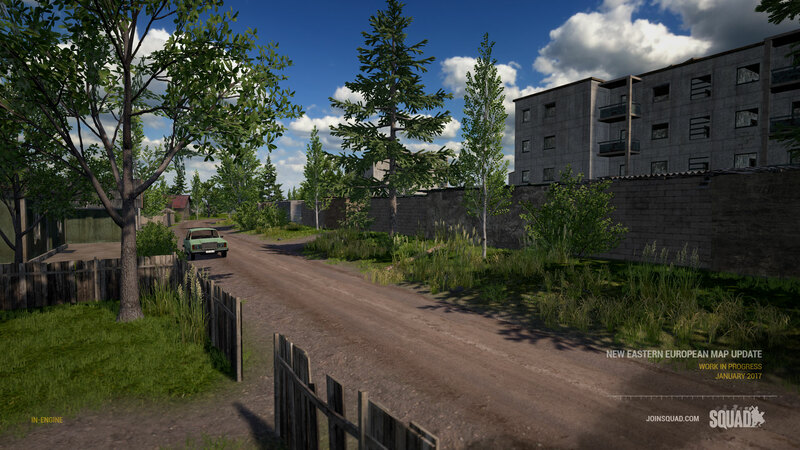 We’re adding a couple more sections to Yehorivka, some spread out residential and some industrial orientated with more complex structures for you and your squaddies to fight in. Please look forward to it! 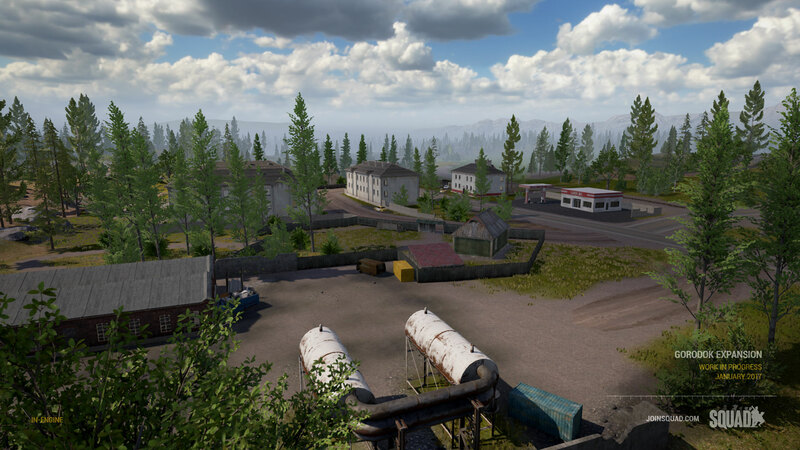 Several updates are coming to Yehorivka that we think you’ll like. 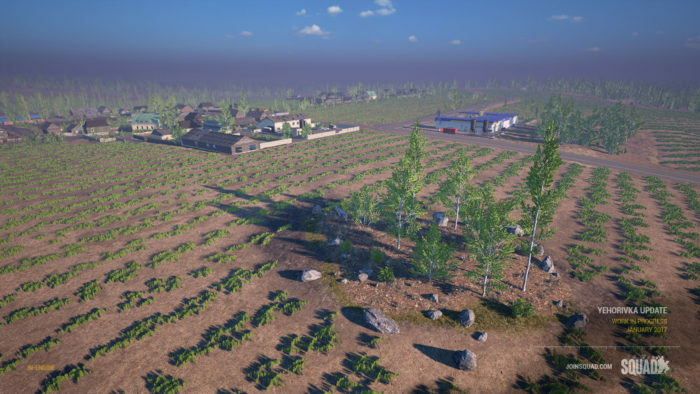 A large industrial complex has been added, the airport is finally getting a facelift, and several existing areas have been touched up with some new buildings to fight in. That’s been our 2017 so far, and now that the team has rested and are back in the swing of things we have some big plans and are looking forward to a very productive February. Expect lots of new and fun developments coming soon!